After President Donald Trump asked why the United States would want people from "shithole countries," referring to Haiti and those in Africa, Judelande Calix of Maryland had a query of her own. "My question is, why not?" said Calix, who is in her mid-30s and came to the United States from Haiti in the late 1990s. Calix went to college; her husband Marc, also from Haiti, is a neurophysiologist, and "countless" other people they know are immigrants who are contributing to this country, she said Thursday in a phone interview. The White House did not deny Trump's choice of language. His comment also referred to the Central American country of El Salvador, the Washington Post reported. "I don't know how else to describe those words except being racist and ... to betray the complete ignorance of history," Arturo Viscarra, 38, a U.S. citizen who came to the United States from El Salvador when he was 4 years old and who is director of organizing and policy at the Central American Resource Center-Los Angeles. "It's just so infuriating and just so shocking," Viscarra said, adding that U.S. policies helped create or fuel civil wars and conflicts in many less-developed nations that have caused people to move to the United States. 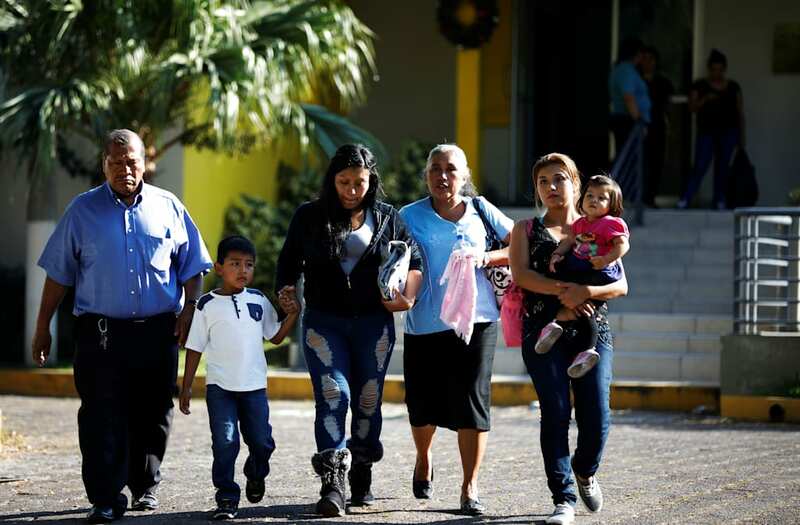 Trump's reported remarks on Haiti, El Salvador and African nations come just days after news that the Department of Homeland Security plans to end temporary protected status for 200,000 Salvadorans currently living in the United States. Some said they were not shocked by the tone of Trump's comments. Steven Nelson, director of the African Studies Center at UCLA, called Trump’s remarks "incredibly offensive, but not surprising, given the source." "He wears his ignorance like a badge of honor," he added. In Los Angeles’ Little Ethiopia neighborhood, Yoni Kebede, 29, the co-owner of a tax and immigration business who came to the United States with family when he was 12 and is a U.S. citizen, said he isn't sure whether Trump believes the things he says. "Trump comments, he says a lot of extraordinary stuff every day to the point where people are not taking it seriously," Kebede said. He said he wasn't sure if Trump was trying to "get some electorate excited." Two sources briefed on the meeting said that, during the portion of the conversation about Haiti, which came at the top of the exchange that led to the vulgar comment, the president questioned why Haitians should be given specific consideration. "Why do we need more Haitians, take them out," he said, according to the sources. Someone else in the room responded: "Because if you do, it will be obvious why." Around 830,000 people with Haitian ancestry live in the United States, according to the U.S. Census Bureau's 2009 American community survey. The Pew Research Center said an estimated 2 million Hispanics of Salvadoran ancestry lived in the United States in 2013. Pew also estimated that there were around 2.1 million African immigrants in the U.S. in 2015. Calix, of Maryland, was taken aback when told of Trump's remarks. "I'm just really shocked, and frankly ashamed. He's making it harder and harder ... for having elected somebody like him," she said. Calix did not vote for Trump. But she said, "Collectively the country elected him, so he's everyone’s president. That's a beautiful part of democracy." Although they did not use profanity to directly target the continent, other U.S. leaders have made comments about Africa that were met with derision. President George W. Bush in 2001 said: "Africa is a nation that suffers from incredible disease." Speaking at a 2014 summit, Vice President Joe Biden also referred to Africa as a "nation," one he said had potential to "join the ranks of the world's most prosperous nations." But UCLA's Nelson said the remedy for Trump seems more difficult. "You are battling someone with a history and someone who is just not curious about the world," Nelson said. He pondered what it would be like to try to educate the president on Africa’s contributions to culture and history, then paused, saying: "For Donald Trump, I think that It would just fall on deaf ears."